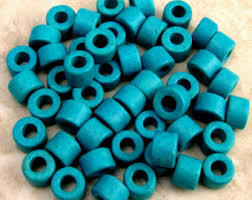 These beads from Greece are ideal for use with leather, hemp and other thick cords. Available in the shapes pictured. While the hole size will vary somewhat from bead to bead, these should easily slip a 2mm cord. PLEASE BE AWARE: The appearance of colors on your screen may vary, depending on both the hardware and software / browser you are using to view this page. Also, when purchasing bead products, please realize that there may be some actual variation in the colors and markings from bead to bead. 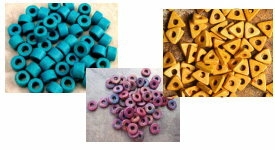 The 4x6mm mini-tubes are usually available in all these colors. We will let you know what's in stock when you are ordering. Suggested colors for creating a "rainbow": red, orange, yellow, brite green, royal blue/cobalt, and hot purple.